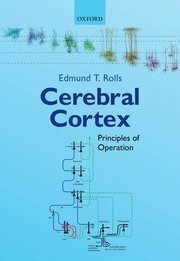 Cerebral Cortex Rolls Edmund T.
Auteur : Rolls Edmund T.
The aim of this book is to provide insight into the principles of operation of the cerebral cortex. These principles are key to understanding how we, as humans, function. There have been few previous attempts to set out some of the important principles of operation of the cortex, and this book is pioneering. The book goes beyond separate connectional neuroanatomical, neurophysiological, neuroimaging, neuropsychiatric, and computational neuroscience approaches, by combining evidence from all these areas to formulate hypotheses about how and what the cerebral cortex computes. As clear hypotheses are needed in this most important area of 21st century science, how our brains work, I have formulated a set of hypotheses about the principles of cortical operation to guide thinking and future research. The book focusses on the principles of operation of the cerebral cortex, because at this time it is possible to propose and describe many principles, and many are likely to stand the test of time, and provide a foundation for further developments, even if some need to be changed. In this context, I have not attempted to produce an overall theory of operation of the cerebral cortex, because at this stage of our understanding, such a theory would be incorrect or incomplete. However, many of the principles described will provide the foundations for more complete theories of the operation of the cerebral cortex. This book is intended to provide a foundation for future understanding, and it is hoped that future work will develop and add to these principles of operation of the cerebral cortex. The book includes Appendices on the operation of many of the neuronal networks described in the book, together with simulation software written in Matlab. - 22: Which Cortical Computations Underlie Consciousness? Professor Edmund T. Rolls performs full-time research at the Oxford Centre for Computational Neuroscience, and is professor of Computational Neuroscience at the University of Warwick, and has acted as Professor of Experimental Psychology at the University of Oxford, and as Fellow and Tutor of Corpus Christi College, Oxford. His research links neurophysiological and computational neuroscience approaches to human functional neuroimaging and neuropsychological studies in order to provide a fundamental basis for understanding human brain function and its disorders.